Shadow Worlds explores artistic responses to the hidden, the subtle and the overlooked through installation, photography, textiles, video and sound. 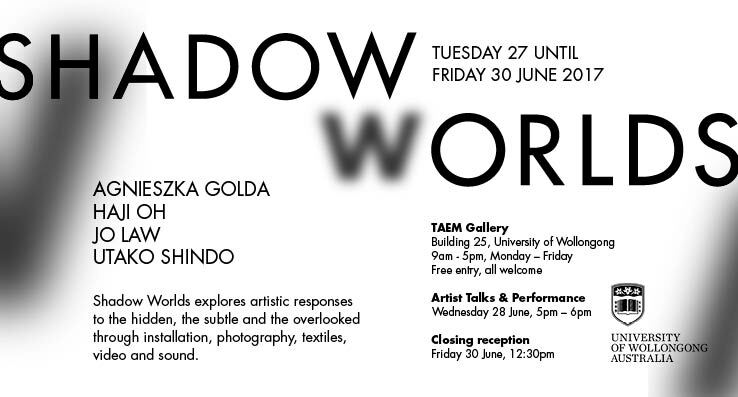 A performance by Linda Luke (dancer) and Terumi Narushima (musician) in response to the Shadow Worlds exhibition will take place on Wednesday 28 June 5pm. Following the performance, join artists Haji Oh, Utako Shindo, Agnieszka Golda and Jo Law for a talk about their works and discover the ideas and stories behind the art on display in the Shadow Worlds exhibition. Screening of the film Revelation from the Sea by artist Taeko Tomiyama introduced by Rebecca Jennison. In this work, the artist responds to the earthquake, tsunami and nuclear disaster of March 2011.